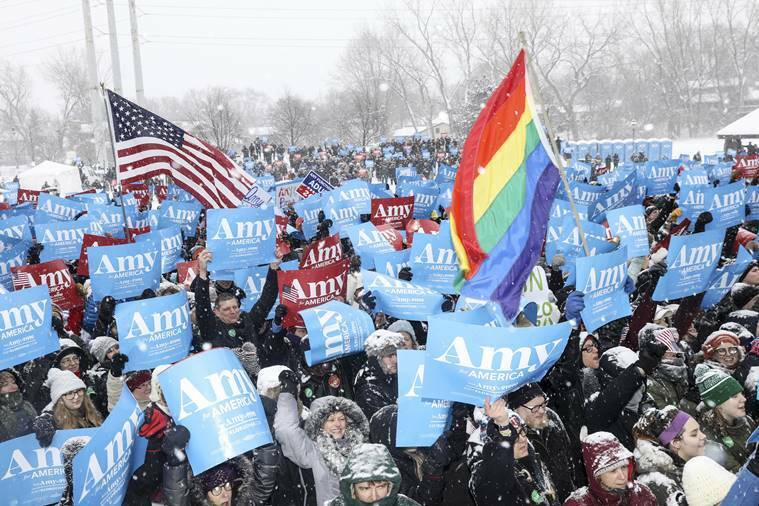 Amy Klobuchar, the third-term Minnesota senator, entered the race for the Democratic presidential nomination Sunday, hopeful that her moderate politics, Midwestern roots and carefully cultivated history of bipartisanship can appeal to a broad swath of voters in contentious times. On a snow-covered stage in Minneapolis along the banks of the Mississippi River, with the temperature barely above single digits, Klobuchar said that as president, she would “focus on getting things done” and reverse some of President Donald Trump’s signature policies. On her first day in office, she said, the United States would rejoin the Paris climate agreement. Klobuchar, 58, is the fifth woman currently serving in Congress to announce her candidacy, joining a crowded and diverse field of Democratic presidential hopefuls. With most of the top-tier candidates hailing from coastal states, Klobuchar believes her low-key brand of “Minnesota nice” politics could make her a compelling candidate, particularly to the Iowa voters who cast the first primary votes and in states like Wisconsin, Michigan and Pennsylvania that swung the 2016 election to Trump. A politician who prides herself on being able to “disagree without being disagreeable,” Klobuchar coasted to victory in November, beating her Republican opponent with 60 percent of the vote in a state that Trump nearly won in 2016. She won with much larger margins than other high-profile Democrats running statewide. Despite Klobuchar’s friendly public persona, she’s said to be a difficult boss. A survey of senators by the website LegiStorm from 2001 to 2016 found that her office had the highest turnover in the Senate. “I have high expectations,” she told The New York Times last year. A recent HuffPost article portrayed her as a demanding manager who lost some potential 2020 campaign staff members because of her reputation. Republicans latched onto that criticism Sunday, dismissing her candidacy as one of limited appeal. “She has virtually no grassroots backing and even her own staff is complaining that she’s ‘intolerably cruel,’” Michael Ahrens, a spokesman for the Republican National Committee, said in a statement. Her popularity at home, however, was hard to dispute. Despite the distinctly Minnesota weather, supporters turned out by the thousands Sunday, cramming into a riverfront park wearing snow pants, ski goggles and parkas. Some even arrived on cross-country skis or brought dogs wearing coats. 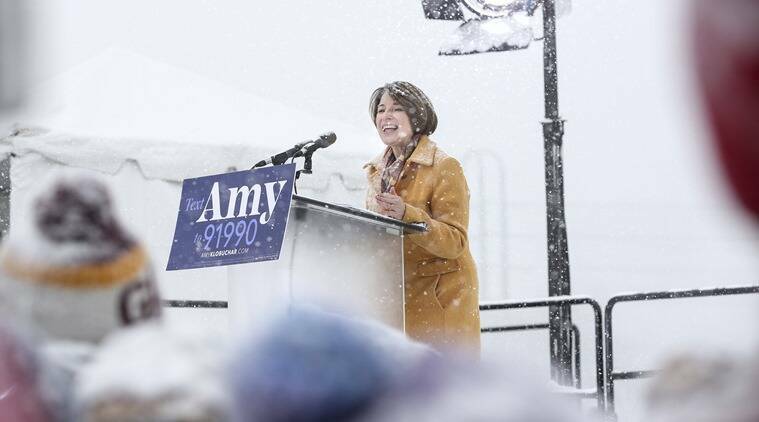 As snow accumulated on her coat and microphone, Klobuchar told the crowd that she would focus on reforming election laws, including a plan to automatically register people to vote when they turned 18. She also pledged to expand laws protecting online privacy. While her approach may appeal to centrists and moderate Republicans in her home state, her breaks with liberal orthodoxy risk alienating the ascendant progressive wing of her party. Klobuchar backs a less expansive college affordability proposal, has not embraced Sen. Bernie Sanders’ “Medicare for all” legislation and has not joined the movement to abolish the Immigration and Customs Enforcement agency. Facing a relatively safe re-election race, Klobuchar spent most of the midterms promoting other Democrats running for office in her home state. She has made numerous visits to Iowa during her 12 years in office, most recently to push a message of “heartland economics” to rural residents and farmers, arguing that Democrats cannot afford to forget about the middle of the country. Klobuchar grew up in the Minneapolis suburbs as the daughter of a schoolteacher and a columnist for The Minneapolis Star Tribune. After graduating from Yale and the University of Chicago Law School, she returned to Minnesota to work as a corporate lawyer. The birth of her daughter, who was born with a condition that required her to remain in the hospital, plunged her into political activism. Klobuchar pushed for legislation that would guarantee new mothers a 48-hour hospital stay, a proposal that eventually became federal law. She was elected prosecutor for the state’s most populous county in 1998 and became the first elected female senator from her state in 2006. In the Senate, Klobuchar has cultivated a worker-bee persona, not leading on divisive issues like immigration and focusing instead on curbing the cost of prescription drugs, addressing sexual harassment and protecting online privacy. A 2016 analysis found that she had passed the most laws of anyone in the Senate. “When I turned on the TV and watched that hearing, I was so damn proud she was our senator,” said Gov. Tim Walz, one of several Minnesota officials who spoke at Klobuchar’s event. Published on Mon, 11 Feb 2019 07:46:17 GMT, © All rights reserved by the publisher.